Learn what is driving manufacturers to focus on creating more efficient manufacturing operations and which manufacturers are most successful in achieving these efficiency gains. 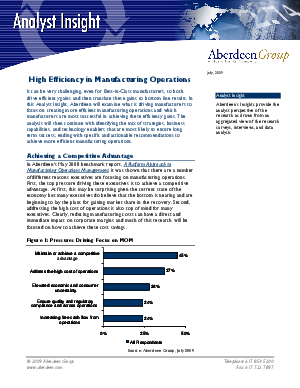 This Aberdeen paper also highlights specific and actionable recommendations to achieve more efficient manufacturing operations. It can be very challenging, even for Best-in-Class manufacturers, to bothdrive efficiency gains and then translate these gains to bottom line results. Inthis Analyst Insight, Aberdeen will examine what is driving manufacturers tofocus on creating more efficient manufacturing operations and whichmanufacturers are most successful in achieving these efficiency gains. Theanalysis will then continue with identifying the mix of strategies, businesscapabilities, and technology enablers that are most likely to ensure longterm success; ending with specific and actionable recommendations toachieve more efficient manufacturing operations.